The reason I find bananas so abhorrent is mainly because a banana in a lunch bag crammed into a steamy coat closet in an elementary school classroom will not only infect every other piece of food in the bag with its noxious banananess, but it will permeate your insulated plastic lunch bag as well, making every meal you ever eat out of it taste like aged overripe banana. Forever. If it happens enough, that kind of thing can scar you for life. Even now, when I give the baby a banana the smell of it on his cheeks and his breath repels me. Until recently, I couldn’t think of anything more offensive than perfectly good peanut butter cookies destroyed by banana-stink. And then, after she complained about pantry moths in one of those water-cooler conversations, someone left the person I share an office with a big bag of mothballs. My office-mate was out sick, so the mothballs sat in our office for a full 24 hours before I thought to hang them out the window until she could take them home. I taste mothballs in the back of my throat when I swallow. I can smell them in my sinuses when I breathe through my nose. It’s been five days. Bananas, you are demoted. Mothballs are the new very worst. Almost all of the very best things are delicate and perishable. Almost nothing wonderful will leave its mark forever on your tongue or in your lunchbag. A peach bruises and turns to mush when you’re not looking; a bottle of wine smashes on the sidewalk when the bottom of your piece-of-crap reusable shopping bag gives out. Asparagus wrinkles and turns into slime if forgotten in the crisper. If you are lucky you will never know the feel of a rotten potato squishing through your fingers. Cheese gets moldy, bread goes stale and grapes become raisins, which is possibly the cruelest fate of all. Somehow, though, kiwis are hardy. 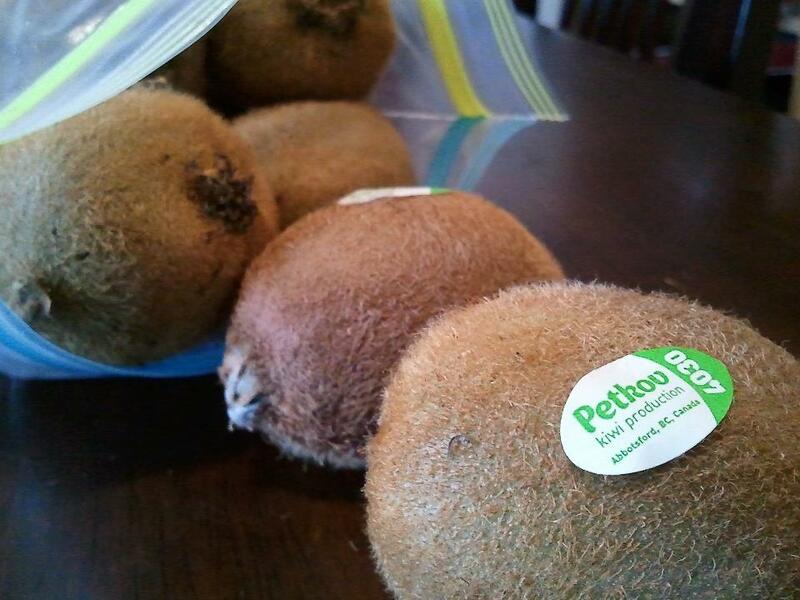 Kiwis, if stored somewhere cool and dark, will last for months. I didn’t know this until recently, when I happened upon a kiwi farmer at our local Farmer’s Market one rainy Saturday. I also didn’t know until recently that kiwi fruit grows quite happily here on the wet west coast. And apparently, kiwi fruit makes excellent jam. So I bought an inordinate amount of kiwi fruit, as you do. 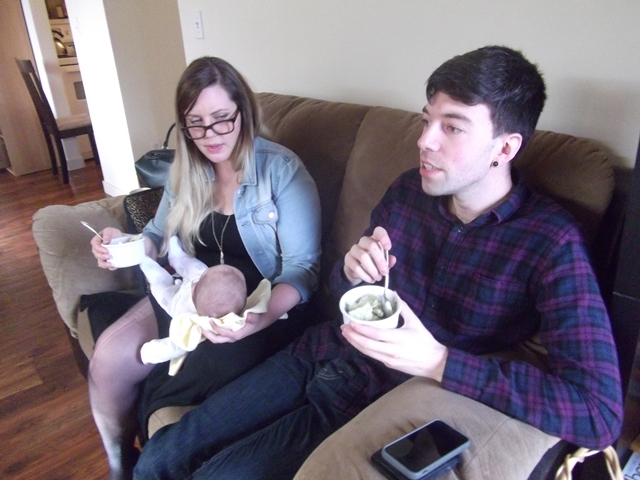 And then I didn’t know what to do with it, and the baby likes bananas so what does he know about anything, so it sat in my crisper for three weeks as I waited for an epiphany and an opportunity and then it happened. Brunch! And friends! 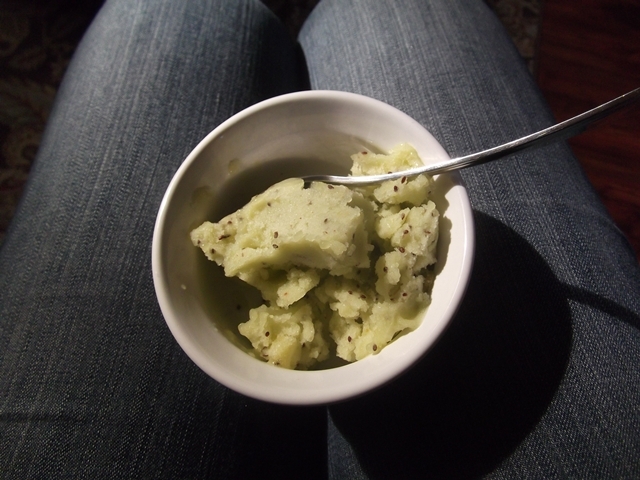 So I made the best thing you can make out of kiwi fruit after just cutting it in half and eating it with a spoon. All I need now is to know how to clean the taste of mothballs out of my inner face. I’ll take any suggestion. Whiz kiwi fruit in a blender or food processor until smooth. Pour into a bowl and set aside. 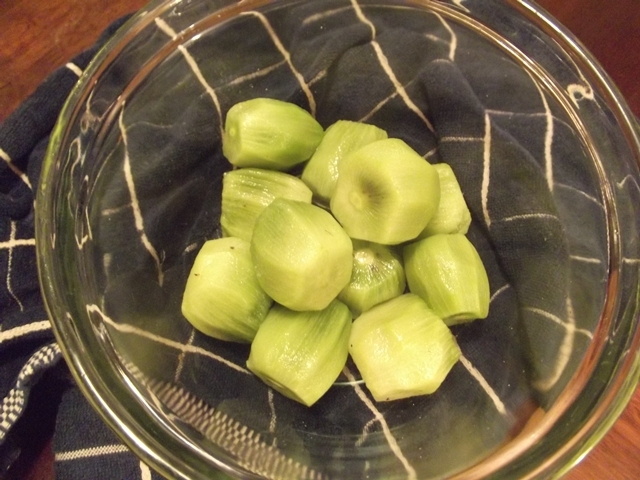 Combine salt, sugar, water, zest and juice in a pot and bring to a gentle boil, stirring to dissolve the sugar. When the sugar has completely dissolved, pour into the bowl with your kiwi purée, and chill in the fridge for at least six hours, or overnight. Freeze the mixture in an ice cream maker according to manufacturer’s instructions, then pour into a bowl, cover with plastic, and freeze until you’re ready to serve it. If you don’t have an ice cream maker, you can turn this into a granita by pouring it into a 9″x13″ pan and scraping it every 30 to 60 minutes with a fork until frozen and fluffy. Or, you can mostly freeze it in a 9″x13″ pan, chip it out into a food processor, and blend until it resembles sorbet. < Previous Creamy garlic and white bean soup. Next > Roasted cauliflower soup. O mothballs. I have insisted to myself for years that I’m somehow allergic to mothballs, because every time I smell them I get terribly nauseous and respiratorially un-OK. I’m sorry. Well. Um…I know what will get the mothball smell out, but mothballs are better, really. Possum poop.The aroma of possum poop will curl your hair and flavor everything for the next 2 weeks then you’ll have flashbacks for the rest of your life. If you have no possums, then how about something super flavorful like Ethiopian food? And the kiwi sorbet looks amazing. Kiwis never last long enough around here to be make into something. That photo of Tracy!! SUCH a mum. OMG. This sorbet was absolutely delicious. I would eat it everyday if I could. Also, mothballs are just TERRIBLE. And so is the omnipresent banana. Katharine: I am pretty sure they are a legitimate poison – I’m only just starting to not taste them when I breathe. Terrible stuff! Rootietoot: Haha, I’d have considered the possums two days ago but now Ethiopian food sounds like a better idea. Definitely tastier. Vanessa: THEY ARE THE WORST. But yes, Tracy looks pretty maternal there. I have been trying to mimic that look so I don’t look like such a creep when I take the baby to the park.